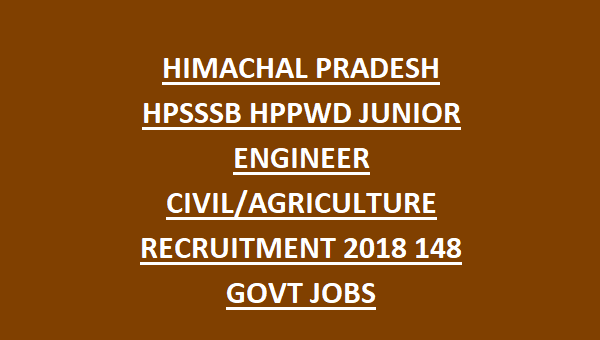 selection for Himachal Pradesh SSSB Junior Engineer (Civil/Agriculture) Recruitment 2018 is will be in two stages. Offline mode applications will not be accepted only online applications will be accepted for this HPTCL HPSSSB Junior Engineer Recruitment 2018. For more details regarding this recruitment of HPTCL HPSSSB Junior Engineer (Civil) eligibility criteria, exam pattern, age limits, qualifications, Pay scale please see below. 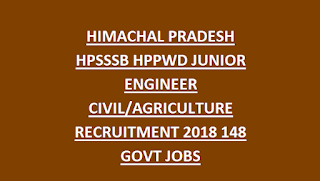 Click here to see the official advertisement of Himachal Pradesh SSSB Junior Engineer (Civil) Recruitment. There are total 12 JE vacancies available in Himachal Pradesh SSSB. Category wise vacancies will be update later. The candidate should have passed 10+2 examination and diploma in civil engineering or A bachelors degree (B.E/B.Tech) in Civil Engineering or its equivalent. Selection for this HPSSSB Junior Engineer (Civil/Agriculture) recruitment is held in two stages. JE Civil Engineering Jobs Recruitment will be held based on Merit in Educational qualifications and based on available vacancies. If large number of applications received then only Written test will be conducted. The candidates who are having the eligibility criteria they may apply online through the official portal of Himachal Pradesh SSSB @www.hpsssb.hp.gov.in. Before applying for this jobs please read the official notification carefully and then proceed for apply. Click here to Apply online for the HP SSSB Junior Engineer (Civil) Recruitment 2018. Please share this HP SSSB Junior Engineer (Civil) Recruitment 2018 article to your lovable friends through online via social web. JE civil ki post ki notification kab tak aa jayegi ..